Simulations are ideal tools for education. They allow abstracted and simplified versions of real-life challenges, which students can experience and learn from in a controlled environment. 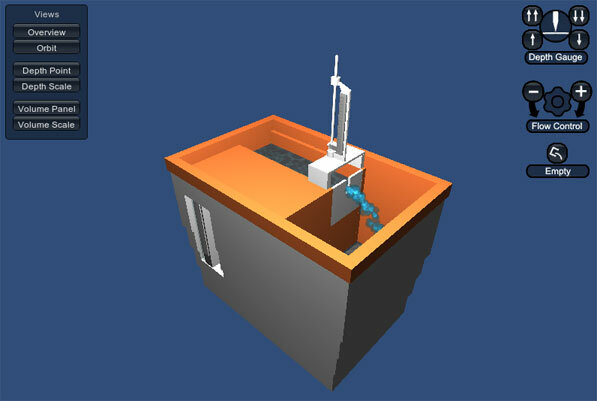 An example is the Armfield basic hydraulics bench that can be used to explore the flow of water under various circumstances, and through which students can investigate the underlying equations. However, these physical simulations still suffer from some limitations. The overheads of setting up the equipment and the necessarily short windows of access that students get, means that making effective use of the equipment is paramount. A recent project involved the creation of a computer simulation of the the Armfield simulation equipment. It is vital to keep the physical simulation, since it provides the messiness of the real, and the whole purpose is to re-discover the underlying mechanisms of the real-world. The benefit of the computer simulation is to have as many attempts as required to feel comfortable with the process and, what is less common, the operation of the equipment.